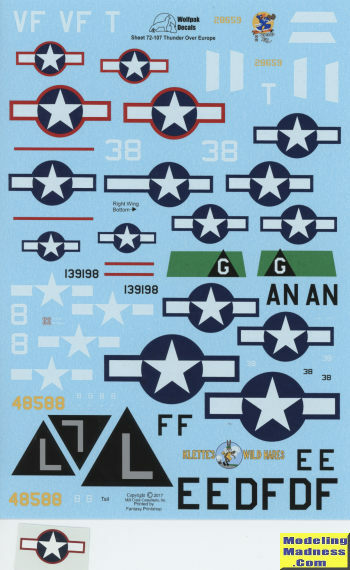 For their second new WWII sheet, Wolfpak Decals heads to Europe. This sheet provides five interesting options for the Modeler. First up is Don Gentile's P-47D 'Donnie Boy' operating with the 4th FG from Debden in 1943. Note the red surround and it appears that it uses the early Curtiss Electric prop. 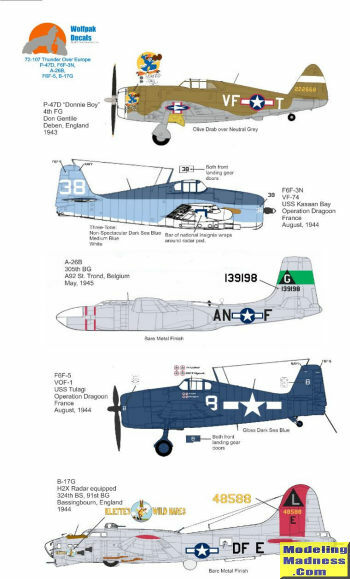 Next is an F6F-3N in the tricolor paint scheme. This plane was operating with VF-74 aboard the USS Kasaan Bay during the invasion of Southern France in August of 1944. One rarely sees WWII A-26s on sheets so it is nice to have this glass nose A-26B. This aircraft was operating with the 305th BG out of St. Trond Belgium during the last month of the European War. Another Hellcat used during the Southern French invasion. This one is an F6F-5 with VOF-1 from the USS Tulagi. The overall gloss sea blue scheme is easy to paint. Finally, a bit of an unusual B-17G. Klette's Wild Hares was operating with the 324 BS/91st BG in 1944 and has an H2X radome in place of the belly turret.